IF YOU LOVE TO COOK, MAKE THE BEST CUPCAKES, BBQ, SANDWICHES…YOU’VE COME TO THE RIGHT PLACE. 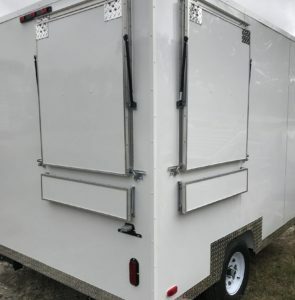 OUR FOOD CONCESSION TRAILERS ARE BUILT TO MEET YOUR BUSINESS NEEDS. 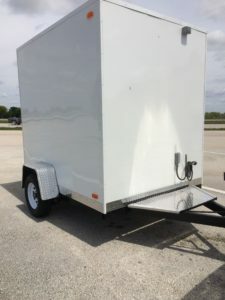 OUR FOOD TRAILERS ARE BUILT IN OLDSMAR, FLORIDA. WE BUILD BASED ON THE SIZE YOU NEED AND CAN CUSTOMIZE YOUR WINDOW PLACEMENT AND ENTRY DOOR. OUR TRAILERS TAKE APPROXIMATELY 4-5 WEEKS FROM CONTRACT TO COMPLETION, DEPENDING ON THE SIZE AND SPECIAL EQUIPMENT, IF ANY, REQUIRED. 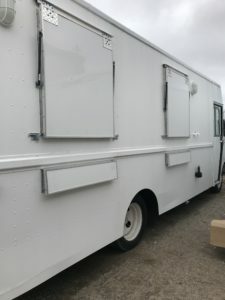 FOOD TRUCKS HAVE BECOME POPULAR, SO IF YOU BUSINESS IS READY TO TAKE ON THE TRUCK, WE OFFER A FEW DIFFERENT SIZES AND CAN COMPLETE TO YOUR NEEDS. WE ARE ALSO AVAILABLE TO GIVE YOU PRICING ON YOUR TRUCK CONVERSION.